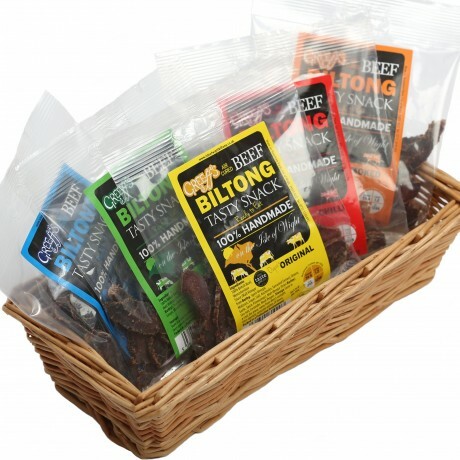 One of each of our unique flavours of British Beef Biltong. Oupas Original, Black Pepper, Garlic, Sweet Chilli, Oak Smoked. Each packet is 30g. We do not use msg or nitrates. Sea salt and Malt (barley) vinegar are used to cure the beef. Our packets are posted to you with at least a 6 month shelf life. Beef, Malt Vinegar barley, sea salt, worcestershire sauce ( spirit vinegar, molasses, salt, anchovies fish, tamarind extract, onions, garlic, spices) black pepper, spices.